New York – The main sparring partner of Manny Pacquiao in his last camp against Timothy Bradley Jr. will be fighting his first fight at the world famous Madison Square Garden which is called “The Mecca of Boxing” this Saturday night. Nineteen year-old Julian Rodriguez of Hasbrouck Heights, New Jersey will be crossing the Hudson River and he will be facing 39 year-old Yankton Southern (4-5, 4 KO) of Springfield Missouri in a 4 round light welterweight bout in the undercard of the middleweight championship match between Gennady Golovkin and Daniel Geale. The undefeated (4-0, 3 KOs) Rodriguez, an alternate in the 2012 US Olympic Team, raves about the time he spent sparring and training with Pacquiao earlier this year at the Wild Card Gym in Los Angeles. “I learned a lot from him. It is really hard to put into words. It is more like, how you feel, how you move and how he moves. “said Rodriguez who admitted that sparring with Pacquiao was a “great confidence boost” for him. Rodriguez and his other co-spar mates aided Pacquiao in retrieving his old World Boxing Organization (WBO) welterweight belt from Bradley Jr. in their rematch last April 12 at The MGM Grand in Las Vegas. He also spoke highly of Pacquiao and the superstar’s demeanor outside of the ring. “Not only did I learn boxing from him, but also as a person. Oh my God, what a great person he is. The most generous guy I have ever met in my life, even outside of boxing. He is just really giving,” described the young boxer who might possibly be called again in the upcoming months to relinquish his role as Pacquiao’s sparring partner when the welterweight champ prepares for his November 23rd fight against challenger, Chris Algieri. 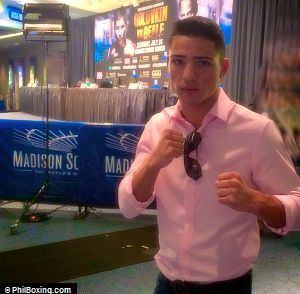 Rodriguez will be enjoying the support of family and friends who will be travelling from nearby Northern New Jersey to New York City to cheer for him Saturday night at The Garden.